Hi everyone! I thought it was time to share with you a few of my favorite things I have discovered recently on Etsy. 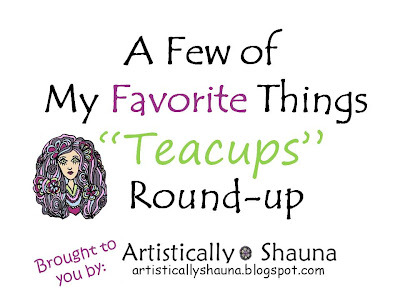 This Round-Up is all about "Teacups". I love how dainty teacups are, I love all of the amazing vintage teacups waiting to be discovered, I love watching my children play with teacups with their dolls and stuffed animals, and I love teacups as an art subject matter. Now, I don't drink tea personally, however I still appreciate teacups loveliness, and I enjoy using some of my favorite teacups as home decor! How about you? 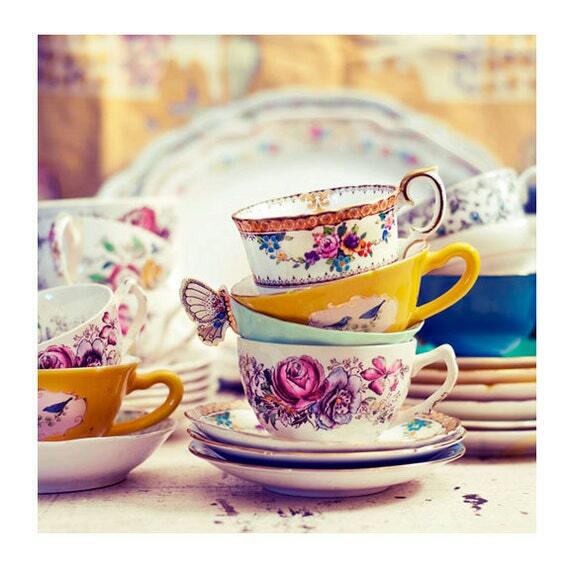 Do you have a love for teacups as well? Enjoy! 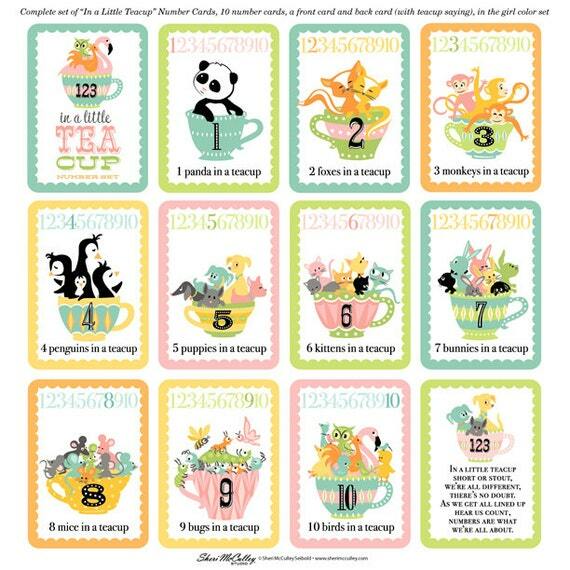 Look at these darling teacup animal counting cards by "Sheri's Creations". You can find these gems in Sheri's Etsy store here. They would be darling to use with your children when learning or reviewing their numbers, they would also be so cute to display in your child's room, playroom, or your classroom. While your checking out Sheri's store, don't forget to look at her darling PandaRama Calendar. Love! I have been a long time fan of Stephanie Fizer Coleman, artist and designer behind "The Fox and the Teacup" shop. I have purchased quite a few items from her and everything she designs is darling. 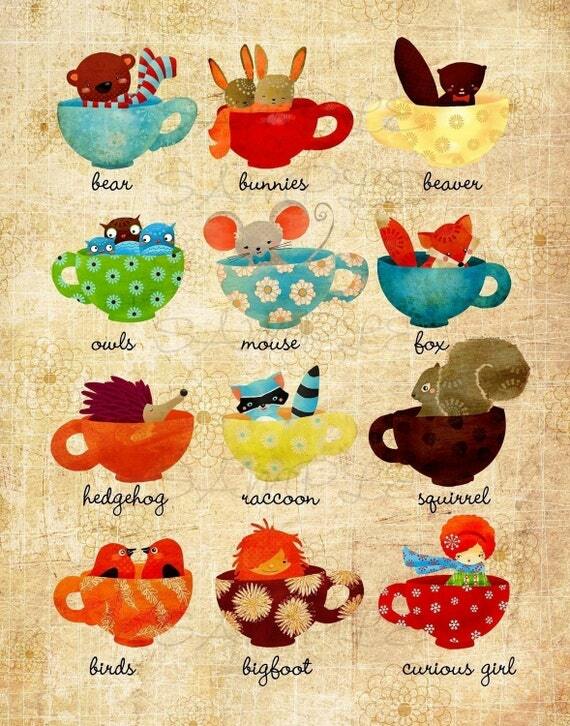 Don't you just love these teacup illustrations? And to be able to adorn your favorite books with them, even better. Stop by her shop here, to pick up these wonderful bookplates. 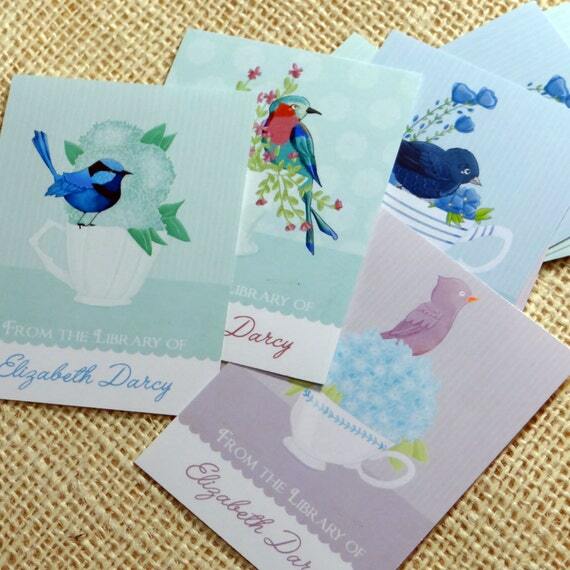 Don't forget to check out her other great stationary sets and art prints. 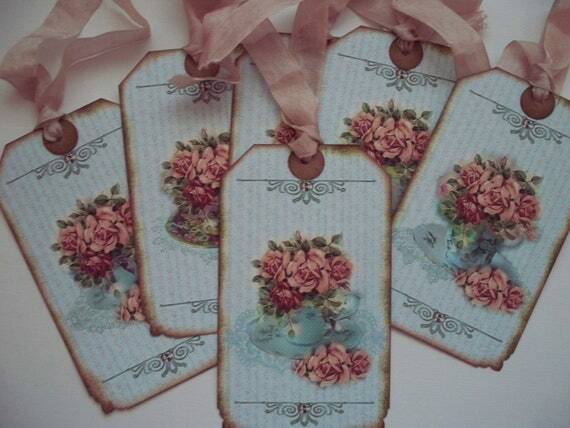 I love the overall design of these beautiful vintage style teacup tags. Wouldn't you just love to receive a gift with one of these beautiful tags attached to it? I know I would. Linda's shop is full of absolutely gorgeous tags. I am so excited to have discovered it! You can find these teacup tags here, but make sure to check out the rest of "Paper Potpourri's" amazing shop full of cards, tags, bookmarks, and more. 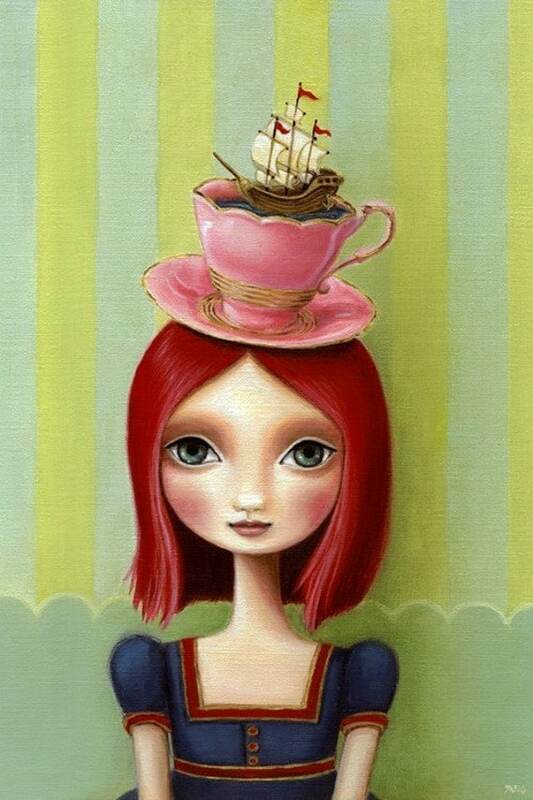 I love how whimsical Kim Anderson's Beauty in a Teacup art print is. So light and airy and such a wonderful overall design. You can find this beautiful art print here in Kim's Etsy Shop, "Kim Anderson Art". I really love Kim's style of artwork and I really like her Floral Joy art print as well. Don't forget to check out all of the rest of Kim's artwork in her shop. Embroidery is an art form that I would love to learn and dive right into. 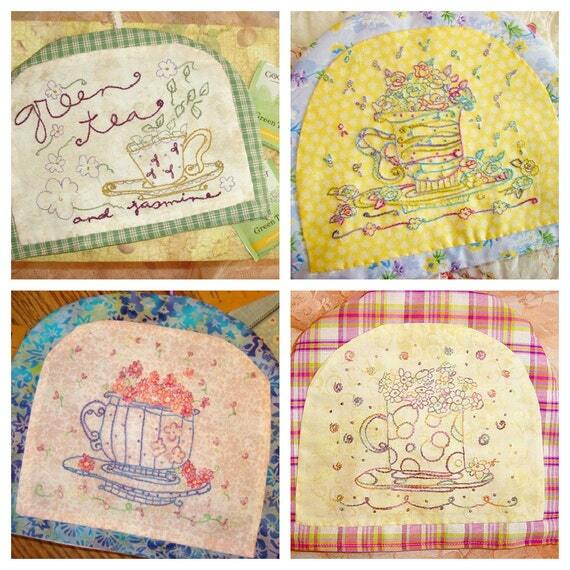 I am so in love with this teacup pattern created by Cathie of "Country Garden Stitchery". Isn't it simply wonderful? I love how Cathie has taken her amazing drawings and turned them into embroidery patterns for all of us to use. I am so excited to have discovered Cathie's Etsy Store and don't forget to click here to purchase this pattern for yourself. My children love to color. They have since they were little toddlers. 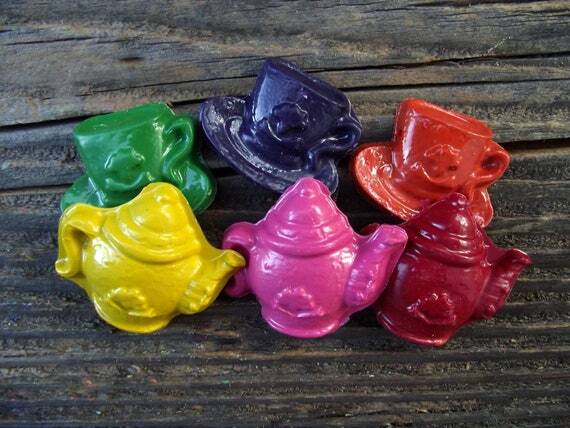 How much fun are these cute teacup and teapot coloring crayons? I know my children would have a blast coloring with them. These cute crayons were created by "Fun Shaped Crayons" and you can find them here. Fun Shaped Crayon shop has over 300 items in it and there is every shaped crayon you can think of. I also particularly love these owl shaped crayons you can find here. Have fun looking at all of the fun and colorful crayons. Oh how I adore all of "Laura Amiss" Art work. Laura is an Illustrator and Designer from the Netherlands. I love how Laura incorporated textiles onto her teacup and coffee pot in her Coffee Time Art Print which can be found here. I couldn't help but smile the entire time I browsed Laura's Etsy shop. Laura's artwork is stunning, the colors are so fresh, and her style is so original. I also fell in love with Laura's Sydney Portrait Art Print. You won't want to miss out on looking at Laura's artwork for yourself. I love discovering artists that inspire me! "Marisol Spoon" is another Etsy Shop that I have loved for a while. The artwork created by this husband and wife team is beautiful and unique. 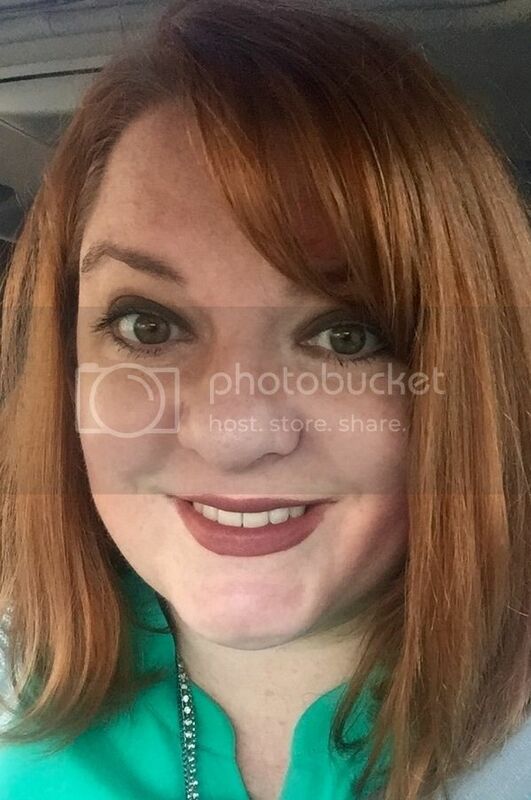 I love big eyes, and being a red head myself, this picture just called out to me. I am definitely adding it to my very long wish list of art I would love to have in my home. You can find A Long Trip to Tea Time Art Print here. It is really hard for me to chose a favorite piece of artwork in Marisol Spoon's shop because I love them all, however I really love this art print Effie and her great cat eyeglasses. I love a beautiful photograph, and this photograph to me is absolutely gorgeous. I love the composition, the colors, and the photography style. 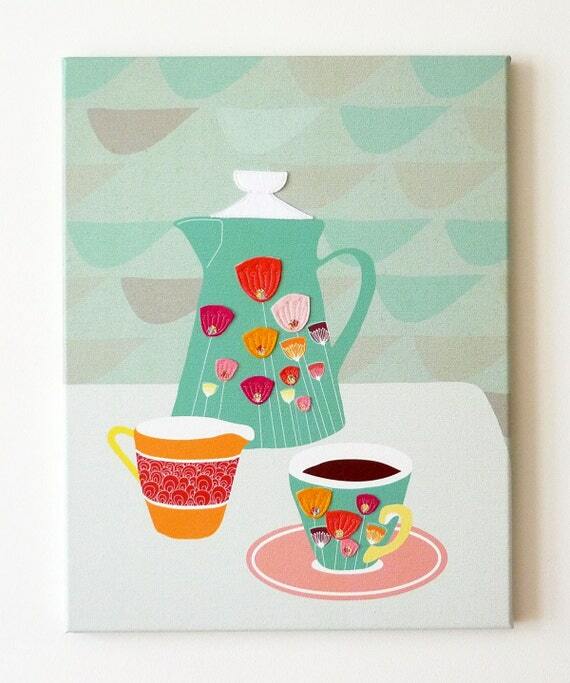 This Tea Party photography print that was photographed by, Elle Moss, can be found here. "Elle Moss Photography" is unique, creative, and visually wonderful to look at. Elle definitely has her own style which has made her quiet successful in the photography world. For a photography feast, click here. I hope that you have enjoyed looking at my wonderful teacup finds. 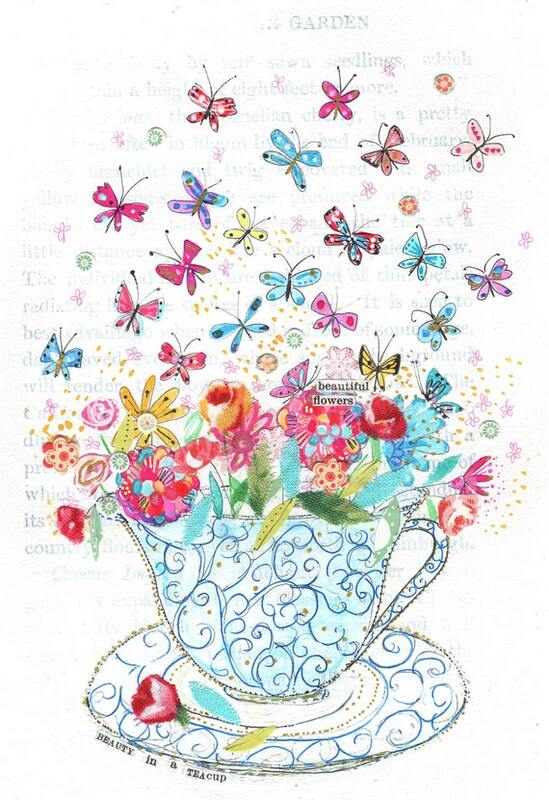 Have you created any teacup art yourself? 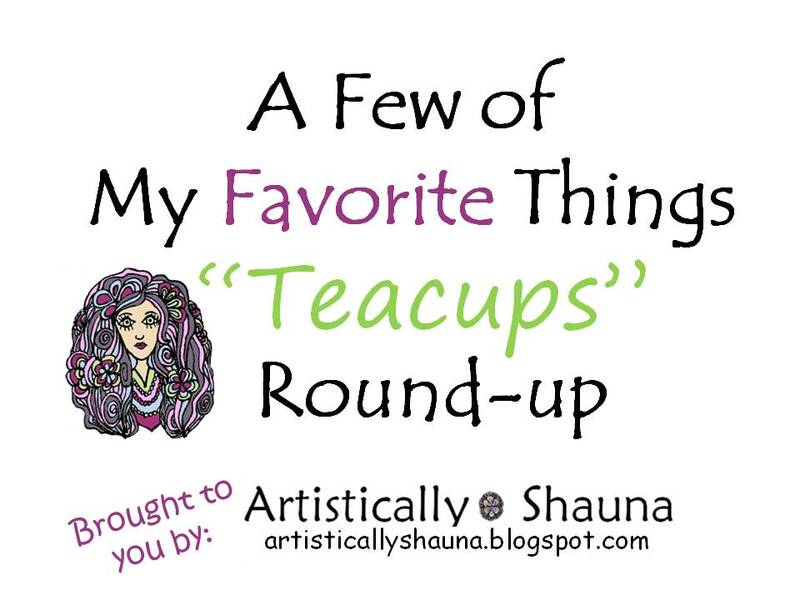 Do you know of other wonderful teacup items that I may have missed? Do you collect teacups? I would love to hear from you. If you are one of the lovely artisans I have featured today, don't forget to grab your "featured button" on my side bar. 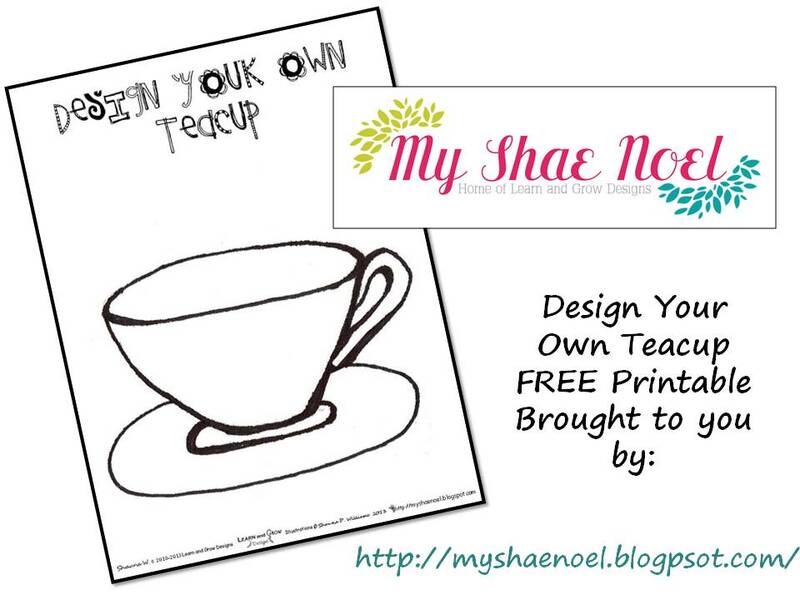 Also, if you have children, work with children, or are a kid at heart yourself, don't forget to check out my fun and Free "Design Your Own Teacup Printable" on my other blog: My Shae Noel. The post looks so nice and lots of pretty tea themed items! Thank you for including my patterns. 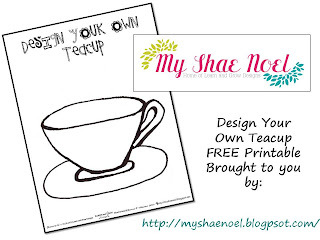 I love when you do these round ups on this blog and your my shae noel blog. You always find such beautiful things and such variety even within a common theme.